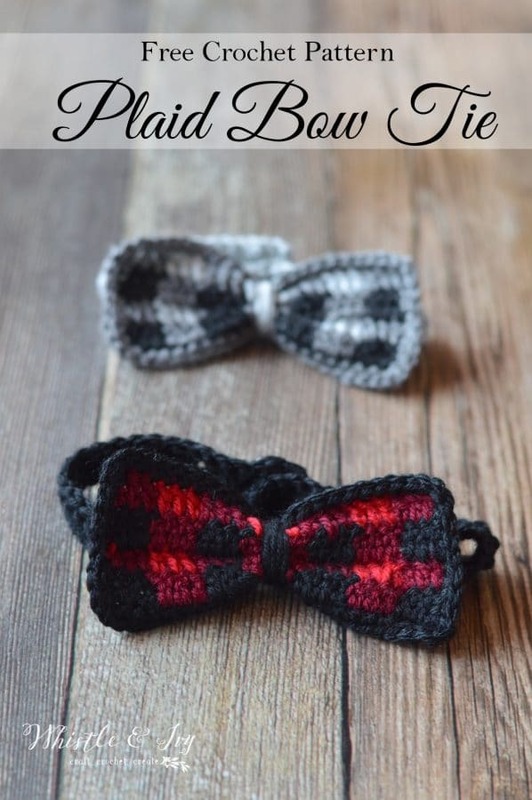 Make this adorable crochet plaid bow tie, perfect for fall and for the holiday! 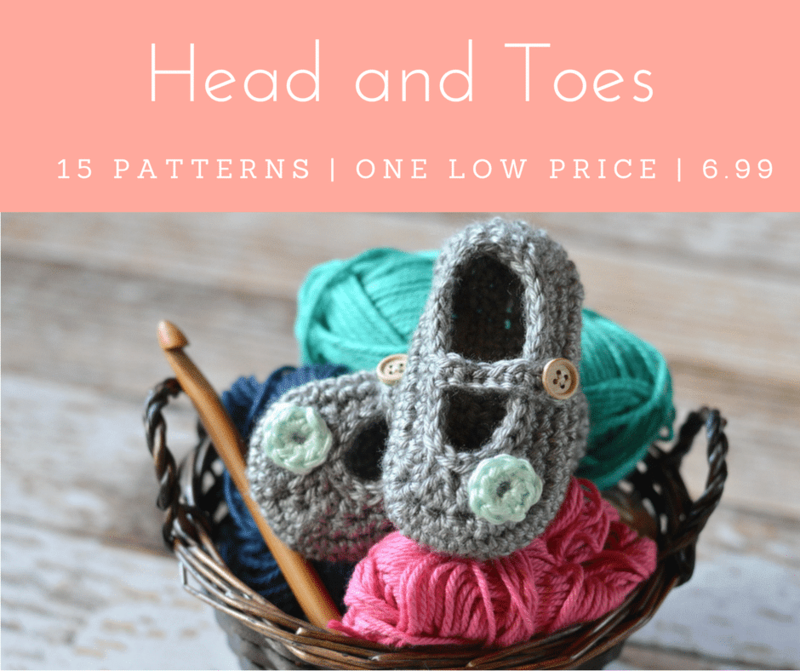 Enjoy this free pattern. Today I bring you another reader request! 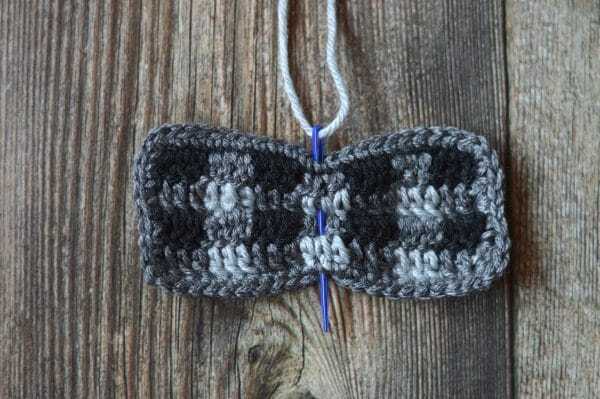 One of our friendly group members asked if I could make a crochet plaid bow tie. I really meant to get to it sooner, but I am working some some really fun projects that are taking up most of my time (be sure to subscribe so you don’t miss anything). However, I found a bit of time this week and made a few. 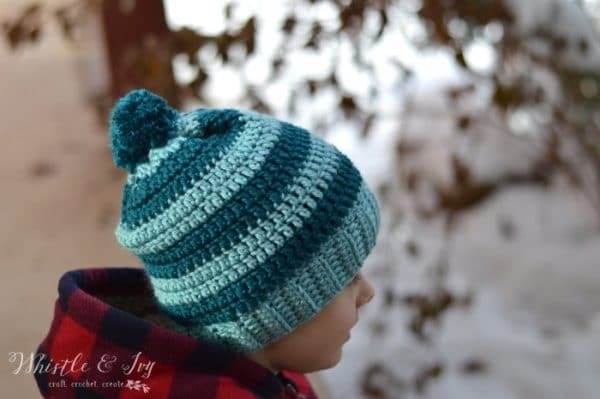 This crochet pattern turned out to be a fun and quick little project, and it looks so cute on The Boy. 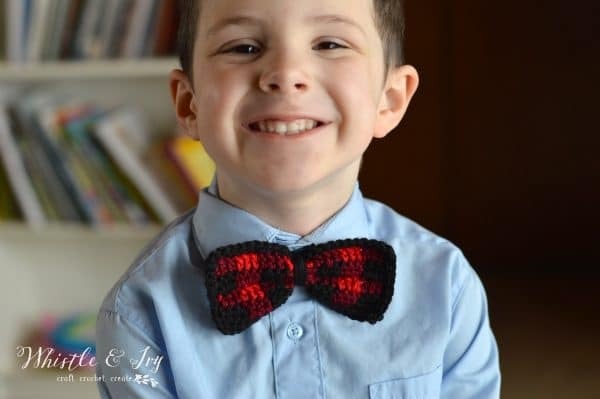 He has always been my super sweet crochet model, I am so blessed to have this kid! With dark color ch 23. 2.- 4. Carry all yarn through the row. Don’t break yarn. Sc all around the bow. Join with first st. Tie off. ch 50 (approx 12.5″ long) Work more chs here for a longer band. 2. Ch 1. Sc in same st. *Ch 1. Sk next st. Sc 3. * work twice. Sc in each remaining stitch. (49 sts)Turn. (You can work more button holes by repeating the instructions between the **. 3. Ch 1. Sc in each st across. (49 sts) Tie off. Weave in ends. Sew a button to the end of the band without the button holes. Putting a long length of yarn on your darning needle, push it through the bow going in from the top, out and down the middle, and out the bottom. Tug the end of the yarn so the bow is in the middle it. Tie a tight knot in the front of the bow, pinching it into a bow shape. Lay the band behind the bow and wrap the ends (in opposite directions) a few times around the middle, hiding the knot and attaching the band to the bow. 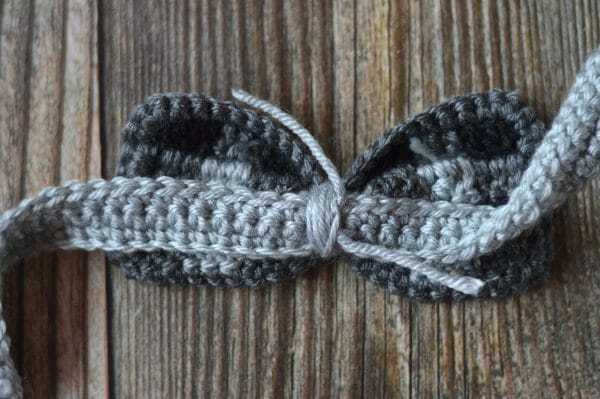 Finish by tying the ends in the knot on the back of the bow. Thanks for joining me today! More crochet coming your way. 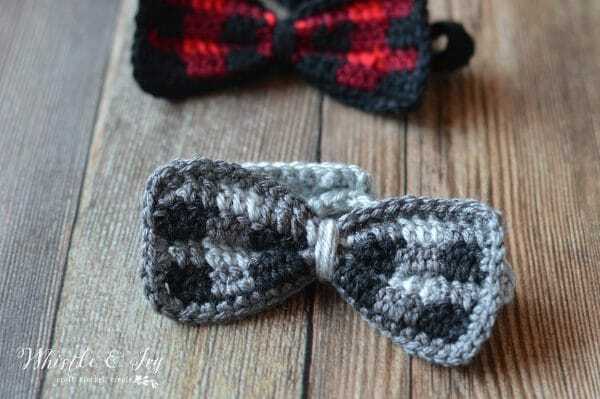 Like this crochet plaid bow tie? Subscribe! 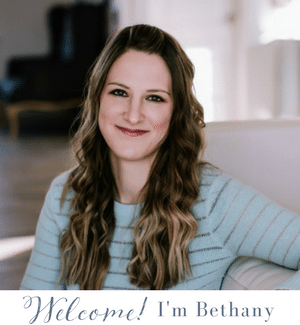 Hi, Bethany. I am quite confused with the first row after you ch 23. You said to start the first dc on the 2nd ch from the hook. But at the end of the row, I still have an extra chain. Did you mean that after dc 3 with the dark color, I have to put dc in the last ch in mid color? If I put dc in the last ch in mid color, then start the second row with the mid color, the color blocks won’t allign with the first row. You should have 7 complete blocks of color (21 sts). Do you have 21 stitches? 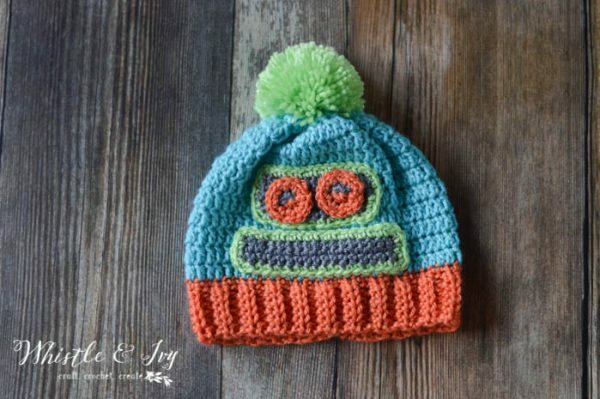 Hi there, i would love to make this in baby size. What length would you recommend for the band length? I don’t, but honestly, this bow would probably works for an adult! You could go up a hook size or two and then make the band longer. How do you do the part that goes around the neck? Secure it with a button and button hole?? Yes the instructions include a button hole and indicate to sew a button on the opposite side. OK. I’ve made the tie and the neck strap… but how long to make it since this yarn stretches??? My daughter’s teacher wears a bow tie every day, so I made one in their school colors. If he’s a 17 inch neck, I made three button hole options. Now I’m undecided on how long to make it. 16 inches? Any input?? 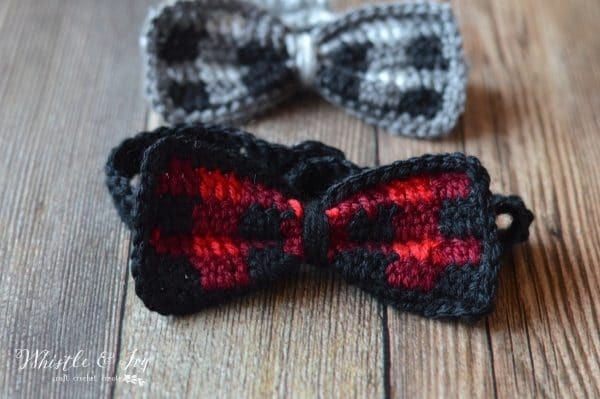 I have a grandson due in March, his Buffalo plaid beanie is made, now this bowtie, perfect addition to my idea…I just now need some crochet dungarees for a homecoming gift. His nursery is Woodland Themed, he will fit right it! Dp you have any dungaree with suspender patterns in your repertoire? Thank you, I love your patterns and ideas! Aw! SO cute! I don’t have a pattern for those, so sorry! Awesome! I have not done any color change work and this would be a great starter. I have barrettes to decorate. Thanks for your generosity and creativity! You are welcome! I hope you enjoy making them! Oh my goodness! Could you design a headband for girls or would this work? Loving this! Yes I can! Thanks for the suggestion! 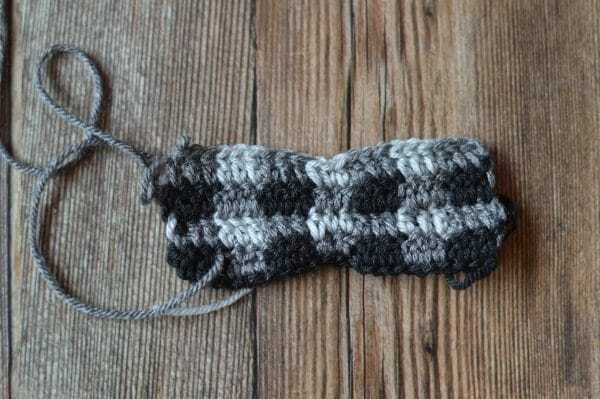 I would love a pattern for a girl’s headband! It would be adorable for Christmas! I am not sure if you thought of this but, this would also be cute on dogs. I am in love with all your plaid patterns. 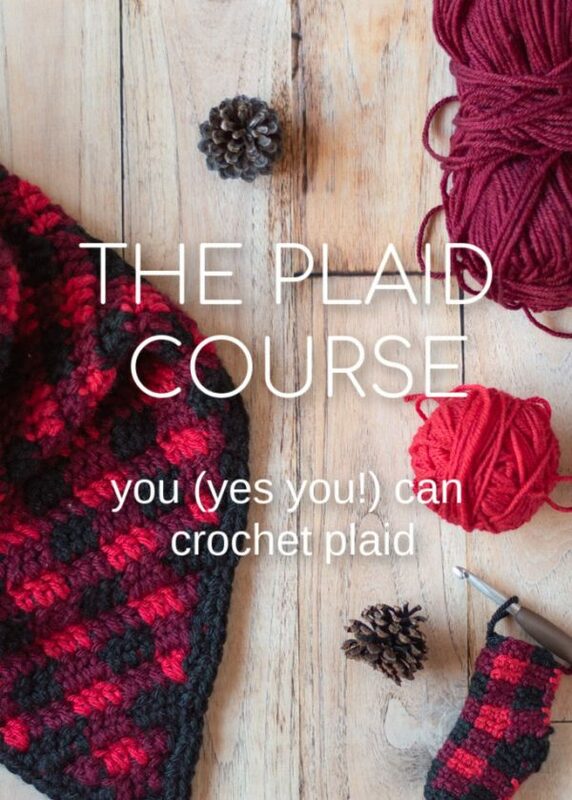 By any chance, do you have a plaid pattern for a baby sweater? 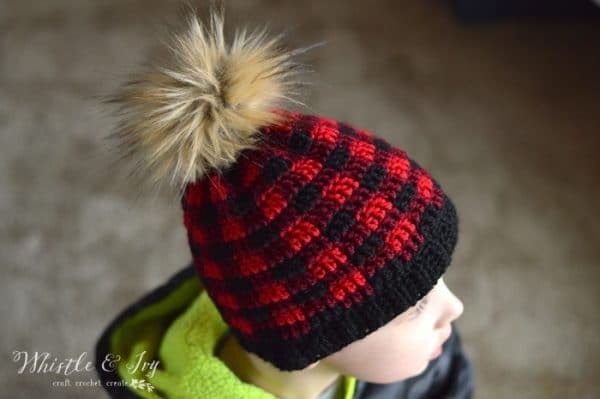 I am expecting my 3rd grandchild and my son loves everything plaid. Would love to surprise him with a plaid baby sweater for his little girl to come home from the hospital in. Oh congratulations! Currently I don’t, but I have gotten SO many requests, I promise will try to get to all of them. Thank you for the suggestion, I will add it to my list! I am sorry I don’t have it for you! I am going to see if I can create something. Will send you a picture if it turns out. Thank, I would love to see!